Home | Blog | August 2015 Card Kit Reveal!! 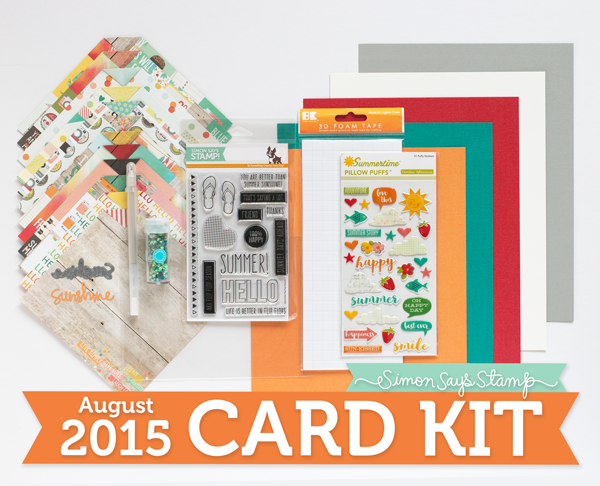 August 2015 Card Kit Reveal!! 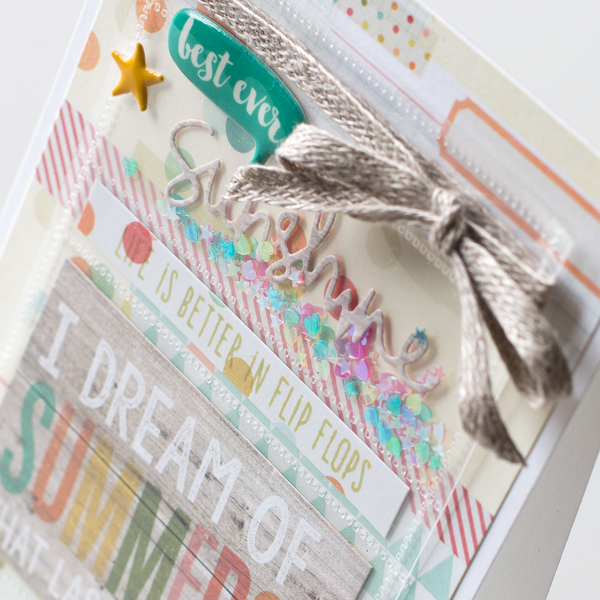 Hello everyone, it’s the 14th of the month and that means it’s time to reveal our August card kit Summer Sunshine! I love this kit… hands down my favorite so far! 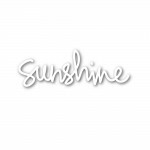 It’s packed full of fun goodies including the Simon Says Stamp clear set “Flip Flop Season”, and a cute little “Sunshine” die, and a special mix of confetti called Fairy Tale. Also in this kit is a Simon Says Stamp storage pocket that you can store your stamps in or use like I did on my card below. The pattern papers are from Simple Stories their Summer Vibes collection with 12 6×6 sheets, along with some beautiful My Mind’s Eye Shimmer papers in Carrot Stick, Tropical Bay and Imperial Red. You’ll also get Simon Says Stamp cardstocks and a pack of foam adhesive from Best Creations. As if that isn’t enough, you also get a pack of October Afternoon Pillow Puff stickers and a Sakura Jelly Roll pen! What a deal!! I decided to use my storage pocket to create a fun panel on my card that hold cut papers, my message and some confetti with a die cut. I had a blast creating my pocket shaker panel using my Fuse tool. The Simon Says Stamp sleeves are PERFECT for this and it’s super easy! I’ve shot a video of the walkthrough and how this card came together including using the Fuse tool. You can view it below or on our YouTube channel. 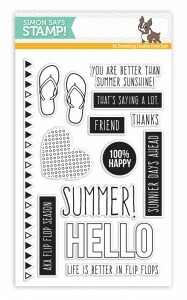 The Flip Flop Season stamp set and Sunshine die are also available for individual purchase in our store. Thanks for stopping by today! We hope you enjoy our special card kit of the month! This looks so fun and summery, gorgeous colours!! A lovely card kit – love those stamps and papers! Super kit!, love the colors and great stamps! what a lovely kit! The stamp set is lovely! TFS! These kits are soooo much fun! I look forward to your monthly kit reveal and card videos, Shari! Thanks so much for taking the time to do them. I just heard about this tool last week. super cute card!! I really want a Fuse Tool, it looks awesome!! Aw man I love this card kit. Gonna have to see how I can sweet talk hubby for some extra cash this month. Choco chip cookies might do the trick. Love this card and the technique using the fuse tool. Thanks for the Shari show and tell with all the wonderful things in the kit and how to use the fuse tool. My project lists just keep growing.